What would motivate pilots to fly long distances aboard ski-equipped ultralights in the middle of the winter to a riverside log cabin? Why would aficionados drive long distances to that same log cabin? 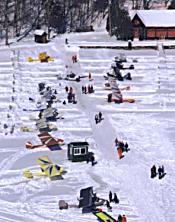 How about: the past fly-ins at this cabin, actually a log castle, have attracted 36 Challengers on skis and over 200 people! So is that a superb reason to get out of your cabin in the middle of winter? 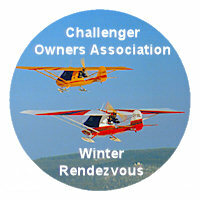 17th Annual Challenger Owners Association Skiplane Fly-in! one hop from home base then head back again. We will encourage them to go one hop farther. Going two flights away will double your universe! to an entire world of wonders non-owners can not even imagine. 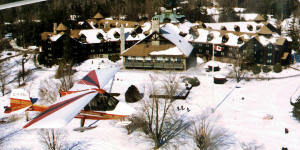 "Montebello is worth the experience for any wannabe. My first trip there by car years ago set the path even though I didn't realize it at the time. Wandering around on the snow covered river among a buzz of Challengers and owners I got the sense of a real close group. Everyone shared information willingly and was proud as punch to show you their airplane. Oh how I longed for the day this would be me showing off my Challenger!" -- John Woudstra, Owner. 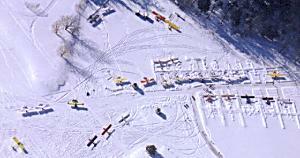 This skiplane fly-in is a wonderful opportunity to look at Challengers close up, exchange information, tell flying tales and socialize with fellow owners and enthusiasts. There'll be great food, warm fires and a plethora of activities, including dog sledding and swimming (outdoors and indoors respectively). 36 Challengers and well over 200 aficionados have attended the Rendezvous! two from Whitehorse, Yukon and one from Kugluktuk, Nunavut. Plus two from New York and one from Minnesota. Wow! Come alone, bring a friend or arrive with your entire family, but don’t miss this unique weekend of winter fun and camaraderie. Snow, rain or shine, it's on! Make your hotel and banquet reservations NOW to avoid disappointment! for your seats at the banquet. Contact info for both appears further on below. Full details appear below - scroll through it all or click the headings to go direct. The organizer of this event is Major Claude Roy, the director of the Canadian Challenger Owners Association. Claude would be pleased to answer your questions or offer assistance. His contact info is at the end below. The Chateau Montebello is the world's largest and most spectacular log cabin. Built in 1930 from 10,000 red cedar logs, the star-shaped structure was constructed in a mere three months by 800 log crafters armed only with axes and scribers. Three crews worked 24 hours a day in overlapping shifts! Their efforts seem to have paid off - Chateau Montebello is known around the globe and has hosted meetings of world leaders, including the 1981 G-7. Now, every conceivable form of outdoor winter activity is offered, including dog sledding! For less hardy souls, there is an indoor Olympic-size pool and spa. The food is gourmet, the rooms luxurious and the ambiance magnifique. Jeans are quite acceptable throughout the hotel during the whole weekend. The first official event of the 2007 Rendezvous will be a reception Friday evening from 6 to 8 pm in Suite 424. What started as a small gathering of Challenger chums hosted by Faye and Gord Ekstrom is now open to all. Last year around 80 people came! Whether you are a long time owner or a brand new wannabe come join us for libations and laughter before dinner! The fly-in begins officially on Saturday morning. Local flyers and drivers start arriving around 9 or 10 and by lunch time most are there. The long distance flyers and true enthusiasts often arrive on Friday or even Thursday. Lucky them! Each day people congregate on the ice in front of the Chateau to chat and look over the Challengers with an eye to casting their ballot for "Best Showplane". Other popular spots to gather include the scrumptious buffet lunch as well as the magnificent fireplace in the lobby. This Rendezvous will feature lots of Saturday sessions of interest to all. At 11:30 in the Quebec Room, Bill Dawes, Challenger dealer for Eastern Ontario, will hold an information session on the new Challenger Ottawa Sport and Skills Centre. Located at the Carp Airport the Challenger Sport and Skills Centre will offer training leading up to winter and summer Sport Flying Safaris. The training will go from the Ultralight Pilot Permit and Passenger Carrying Endorsement on to advanced topics such as floats, skis, navigation, engines and even wilderness survival. The safaris are excursions of two or more aircraft into the backwoods beauty spots of Eastern Ontario and Western Quebec. They will include fishing excursions, photo opps and great sightseeing. Refreshments will be served at the session. At 14:00 there will be two concurrent sessions. In the Quebec Room, Bryan Quickmire, Challenger distributor for Canada, will provide an update on Challenger developments. Bryan will also field questions on all aspects of owning and operating the Challenger. In the Ontario Room, André Girard, Claude Roy and Patrick Vinet will give a slide presentation of last summer's wonderful float flying adventure which they dubbed "Le grand tour du Québec." These sessions will be followed by a refreshment break. At 15:30, there will be two more concurrent sessions. Sylvie Perreault from Transport Canada, Quebec Region, will inform us of the very latest on the regulatory front, including the ongoing reform of Canadian aircraft categories. Frank Hofmann of the Canadian Owners and Pilots Association (COPA) will be giving us his thoughts on the latest trends in the world of aviation. After the afternoon sessions there will be ample time before the banquet for mingling and beverages in comfy chairs around the fireplace in the lobby. Saturday evening the banquet will be held in a private dining hall so we can talk the Challenger talk and walk the Challenger walk. Dress is informal - wear jeans if you wish. Attendance is typically two hundred people who all enjoy the superb meal and excellent company. Awards will be presented and future Challenger events such as the annual summer Float Tour will be discussed. The post-banquet presentation will be a slide show by Kris Falk of Terrace, BC. Kris will entertain us with pictures and stories of his journey on amphibious floats from Montreal to Edmonton in Challenger One Jelly Bean. Many of you have already seen a preview: The Adventures Of One Jelly Bean. On Sunday after partaking of the Chateau's top notch buffet breakfast there will be much hustle and bustle as the flyers prepare their Challengers for the return home. For the more local participants there will be an optional group fly/drive to the renowned Willow Inn near Montreal to partake of their excellent fare. Come if your figure dares! The Saturday night banquet is the venue for presentation of The Maurice Vinet Memorial Award and the awards for "Farthest Flown" and "Best Showplane". The 2006 awards ceremony started with recognition of the many Challenger owners who flew in to the Rendezvous, in spite of the miserable weather forecast for Sunday! Following this there was the presentation of the Challenger Owners Association trophies to convey accolades to worthy owners from their peers. The winner of the "Farthest Flown" Award was Rob Mathers for his 800 km flight alone from Windsor, Ontario to Montebello. The March 2006 issue of COPA Flight featured a most enjoyable article by Rob as well as great pictures from the Rendezvous. After many close votes, Gord Ekstrom finally won a well-deserved "Best Show Plane" Award for his beautifully finished 2001 Challenger II C-IMLC. 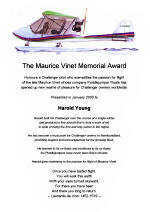 The Maurice Vinet Memorial Award was founded by National Ultralight Inc in 2001 to honour the late Maurice Vinet who passed away from cancer in 2000. Maurice's company Puddlejumper Floats opened up new realms of pleasure for Challenger owners worldwide and is now run by his son Patrick Vinet. 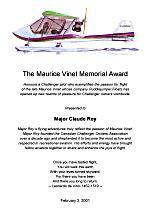 The Vinet Award is presented to a Challenger pilot who exemplifies Maurice's passion for flight. 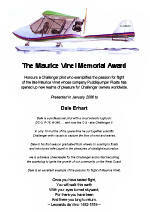 The 2006 Vinet award went to Dale Erhart of Comox, BC. Dale is an A-340 airline pilot, retired CF-18 fighter pilot and extremely enthusiastic Challenger owner. Earlier in the afternoon he had given an interesting and informative session on building his Challenger and flying it on floats on the West Coast. In a short time Dale has become a reservoir of knowledge and experience as well as a sparkplug to ignite the growth of the Challenger on the West Coast. 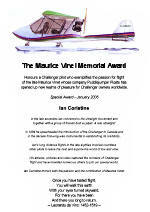 In 2006 a Special Vinet Award was given to Ian Coristine who had retired from National Ultralight, the Canadian distributor of the Challenger. Ian was a pioneer in the ultralight movement in the late seventies and he spearheaded the introduction of the Challenger in Canada in the eighties. His long distance flights plus his articles, photographs and video have inspired countless others to join our world. The 2005 Vinet Award was given to Harold Young of St. John's, Newfoundland. Harold built his Challenger over the course of a single winter and produced a fine aircraft that is truly a work of art. He has become a focal point for Challenger owners in Newfoundland, providing support and encouragement for the growing flock. Harold and his Challenger are somewhat unique in that neither has ever flown off land - only from the water on floats! Harold's Challenger II C-IYNG appears in our Challenger Gallery. Click here to view. 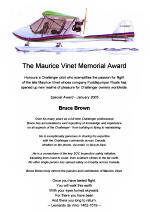 In 2005 a Special Vinet Award was presented to Bruce Brown of St. Lazare, QC. As a full time Challenger professional Bruce has accumulated a vast repository of knowledge and experience on all aspects of the aircraft - from building to flying to maintaining - and he is exceptionally generous in sharing this expertise with the Challenger community. Bruce is a cornerstone of the Challenger SOC Inspection safety initiative and has travelled all over Canada spreading safety far and wide. Bruce recently flew a Challenger from Montreal to Edmonton with Larry Whittaker. Read about the trip in Seven League Boots. 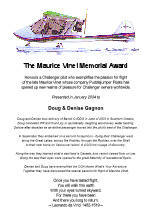 The 2004 Vinet Award went to Doug and Denise Gagnon of Nanoose Bay, BC. Doug has 28,000 hours of air force and airline time and is presently a Boeing 777 captain. Denise has 28 hours and is working on her Ultralight Pilot Permit! In September 2003 the Gagnon's flew their Challenger from Barrie, Ontario (near Toronto) to Qualicum Beach on Vancouver Island - 4,000 km! See Seven League Boots for a brief account of their voyage. The Gagnon's Challenger II C-IDDG appears in our Challenger Gallery. Click here to view. 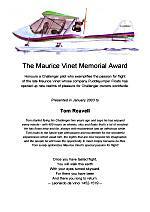 The 2003 Maurice Vinet Award was presented to Dr. Tom Reavell who says he looks to the future with enthusiasm and excitement for the wonderful experiences which await him, the sights that are now beyond his imagination, and the people he will have the opportunity to meet simply because he flies. We'll second that emotion! The 2002 award went to Gord Ekstrom who demonstrates a passion for Challenger flying, building and socializing that sets an example for us all. Gord's exquisite craftsmanship has to be seen to be believed - his Challenger has a special mount for his fly fishing rod! Gord's Challenger appeared on the cover of the March 2004 COPA Flight. The inaugural 2001 award was presented by Maurice's sons Patrick and Andre to the very deserving Major Claude Roy. Claude founded the Canadian Challenger Owners Association over a decade ago and has shepherded it to become the most active and respected in recreational aviation. Claude has logged countless miles in his Challenger on floats and skis, including a flight from Ottawa to James Bay - in the middle of winter! That was the first of what has turned out to be the Annual Challenger Float Tour. Since then Challengers have explored the majestic fjords of the Saguenay Region, the granite rocks of Georgian Bay and the miles long sand beaches of Lake Huron. In 2007 the two-week float flying adventure will draw a big counter-clockwise circle around Algonquin Park, in Central Ontario. The timing will be the first two weeks of August 2007. The tour will depart on Saturday, 4 August, from the Ottawa area to view classic Canadian Shield scenery in the Temagami, Killarney, Muskoka and Haliburton regions. Anyone with an amphibious aircraft and at least one year's experience on floats is welcome to come along for the whole tour or even just segments local to them. The 2006 Challenger Summer Float Tour, dubbed "Le grand tour du Québec", visited such exotic spots in Northern Quebec as St-Bruno-de Guigues, Rouyn, Val d'Or, Senneterre, Clova, Parent, Wetomaci, La Tuque, Lac-à-Jim and Canadian Forces Base Bagotville. The 2005 voyage was to the north shore of the world's largest inland sea - Lake Superior! In August 2004 another float flying adventure happened, this one to Quebec's St-Lawrence North Shore as far as Natashquan. Claude Roy, Andre Girard and Tom Reavell visited enchanting places like Charlevoix, Baie-Comeau, Sept-Iles, the Mingan Archipelago and one of the world's most exclusive deer preserve: Anticosti Island. The 5th annual floatplane adventure took place in 2003, the 100th anniversary of the first heavier-than-air flight by the Wright Brothers. On this momentous occasion, Major Roy organized a two-week float flying adventure to visit the birthplace of aviation, the sand dunes of Kill Devil Hills, North Carolina, on the U.S. Atlantic Coast. Claude along with Tom Reavell and Henry McKinlay made the pilgrimage, tagged "Centennial Flight 2003", crossing the States of New York, Pennsylvania, Maryland, Virginia and North Carolina. On the way back, the States of Delaware and New Jersey were also visited. In August 2000 a group of Challengers became the first Canadian ultralights to attend Oshkosh with its 10,000+ aircraft and nearly 1 million people! This marked the opening of the United States border to Canadian ultralight aircraft and pilots. In a historic role, the Canadian Challenger Owners Association spearheaded the regulatory changes to permit such cross-border flights. Accolades were received from the EAA and COPA as well as from the FAA and Transport Canada! Again this year, groups of owners of ski-equipped Challengers are planning to fly in formation to the Challenger meet, adjusting their itineraries to allow other Challengers to join up en route. We would like to extend an invitation to other Challenger owners to join them and participate in an aerial odyssey. Join a flock, come solo or, better still, organize a formation from your local area! The aerial odyssey is a wonderful opportunity to put some lasting memories in your logbook. Earmark a few days of your vacation backlog and come along! Of course flight plans are subject to weather so leave slack in your schedule! This is true adventure - a great start to your plan to expand the horizon! For more information or to join up with a group or form one yourself contact Major Roy at the email address or phone number given at the end of this page. Those fortunate enough to be owners coming by Challenger will find the flight easy and beautiful. As the GPS flies, the Chateau is at N45 39 / W74 57. This is just west of the village of Montebello, Quebec, on the north shore of the Ottawa River, an endless runway for Challengers on skis. Secure tie-downs will be located in the protected harbour in front of the hotel. Auto gas will be available. Monitor radio frequencies 122.75 enroute and 123.2 within 5 nm of the Chateau Montebello. If you're coming by car (quel dommage! ), Montebello is 80 km from Ottawa: cross to Hull and go east on 148. From Montreal it's 120 km: take the Trans Canada west to Hawkesbury, cross the bridge to Quebec and go west on 148. The Chateau is on the south side of 148, just west of the village of Montebello. You must reserve your room directly with the hotel (see below) and your seat(s) at the banquet directly with Major Claude Roy (see below and Contacts). The Chateau Montebello has set aside a block of 90 rooms for this event, many with two double beds. The special rate is $175 per room per night, a real bargain considering the stature of the hotel and the level of luxury. To reserve your room call the reservation line at 1-800-441-1414 or contact the hotel directly at 819-423-6341. Make sure you specify you are part of the Challenger group. Ours is a VERY popular event so the Chateau does tend to get fully booked VERY quickly. If you call and that is the case then there are a number of quite charming alternatives in the picturesque village of Montebello nearby. Typically there are well over 200 attendees so inevitably many stay in the village and all are more than pleased with their accommodations. Click the underlined name of each establishment below for pictures, rates, etc! If you are silly enough to procrastinate even longer and even those alternatives are sold out then contact Major Roy for assistance. His email and phone info appears at the end of this page. Do this soon or bring a tent and sleeping bag! At the Saturday evening banquet a sumptuous hot-cold buffet will be served and bar facilities will be available. The price is $50.00 per adult and $25.00 per child (under 12), including tax and tip. By Monday January 22nd the hotel needs to know the exact number of people who will be attending. Accordingly, by Friday January 19th Major Roy requires confirmation of your presence at the banquet. His email, phone and mailing address are under Contacts. Your confirmation must include a personal cheque sent to him and dated January 19, 2007 at the latest. The amount of your cheque should cover the full amount of your reserved seat(s). If there is any doubt about your cheque arriving by the 19th let Claude know by email or phone. If for any reason somebody does not show up for the banquet, Major Roy will do his utmost to sell their seat(s) at the door. So far, last-minute takers for the empty seats have always been found and nobody has lost their deposit. Another warning for procrastinators: the banquet has a maximum capacity of 200 people for food service - if it fills up (and it inevitably does) then you will have to dine in the Chateau's main restaurant (not the worst fate imaginable!) and then rejoin the group around 9 pm for the official program. Canadian members of the Challenger Owners Association receive an annual letter reviewing happenings in the Canadian Challenger community and giving details of plans for the coming year. Click here, en français ici, for this year's. The main switchboard number at the Chateau Montebello is 819-423-6341.